Blink and you&apos;ll miss it! 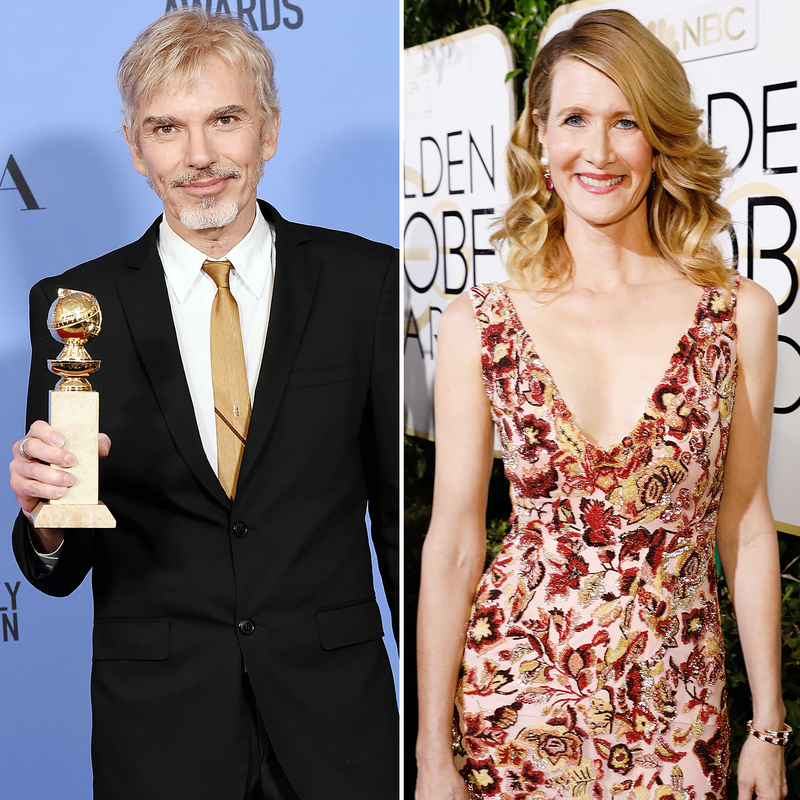 Billy Bob Thornton had an awkward run-in with his ex-fiancée Laura Dern during the 2017 Golden Globes on Sunday, January 8 — and Twitter took notice. Watch the video above! The Goliath actor, 61, briefly walked behind Dern, 49, on his way to the stage to accept the award for best actor in a drama TV series. The exes appeared to avoid eye contact and the Big Little Lies actress briefly looked down. Viewers at home took to social media about the uncomfortable moment. "I&apos;m convinced Billy Bob Thornton walked past Laura Dern just to piss her off. #GoldenGlobes," one commenter wrote via Twitter. A second added: "Remember when Billy Bob Thornton ditched Laura Dern for Angelina Jolie? That was dumb." Thornton and Dern shared a dog and lived together when they dated from 1997 to 1999. The Bad Santa actor called off their engagement and went on to marry Jolie, 41, just months later. Thornton and the Maleficent actress — they infamously wore vials of each other&apos;s blood around their necks — would divorce in 2003 after three years of marriage. Dern opened up about her messy split from Thornton during a past interview with Talk magazine. "I left our home to work on a movie, and while I was away, my boyfriend got married, and I’ve never heard from him again," she said, via ABC News. "It’s like a sudden death. For no one has there been any closure or clarity." Back in October, Melissa Etheridge commented on Thornton and Jolie&apos;s relationship while discussing the actress&apos; current messy split from Brad Pitt. "I was around when Angelina was not doing nice things with Billy Bob to Laura Dern. I went through that on a personal level, and then to know the side of Jennifer [Aniston] and Brad," the singer, 55, said during Watch What Happens Live. "I helped Laura move out of her house with Billy Bob — I, like, broke into their home to get their stuff out because it was so nasty." Y'all got me roaring at these Billy Bob and Laura Dern tweets. All tea no shade. I would think Trump is an okay president if he imprisons Billy Bob Thornton for crimes against Laura Dern.